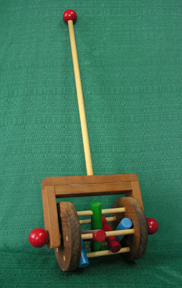 Our Klacker is a reproduction of a classic push toy made by Mary's grandfather for her first Christmas. As the Klacker is pushed, it makes a very pleasant "klickity klack" sound. (We call it quiet noise.) We want you to know that it has been Grandmother tested and approved! The colorful, non-toxic dowels are made from wood. This means that you have a natural pleasant sound (wood against wood), rather than the artificial sound of plastic against plastic. NEWS FLASH! Our Klickity Klacker was chosen by "baby talk" magazine to be in their list of "Toys of the Year", under their sub-title: "Baby Bliss! After a months-long search, we present our picks for the primo holiday playthings". This article - in the December/January 2007 issue - was written by Christina Vercelletto. Her description reads: "This blast from the past is heaps of fun." The Klacker can be used as soon as your favorite little one can sit up. One of our customers gave the Klacker to her grandson when he came to visit. She said he sat for hours just pushing it back and forth! When used by a toddler, the Klacker can become a lawn mower, a vacuum, or just be the Klacker that it is. Be sure and choose your fininsh in our Option Box when you order. The oiled finish is Watco oil - child safe. By chosing "Natural" there will be no finish applied. The colors will remain. Click TOY FINISHES for more information on our finishes.